I grew up at the foot of a mountain on the shores of the Atlantic in a place called Cashel in Connemara. Although I was born in Dingle in County Kerry, I am a Connemara girl through and through. 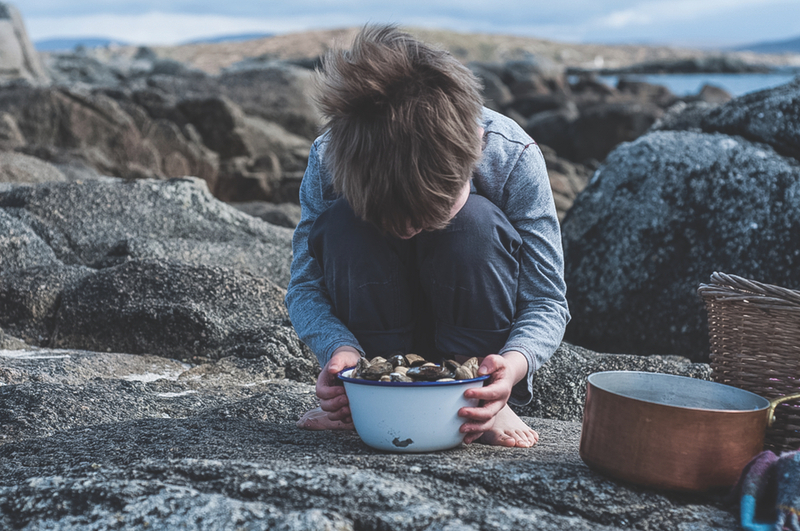 Shortly after my fifth birthday, my family bought a country house hotel by the sea in Connemara, and so we moved up the western coast to start our new life in County Galway. My parents worked hard at the hotel, a family business that demanded all their attention. As a result, during the busy season and the summer holidays, my siblings and I were left to entertain ourselves. To fill our days, we climbed the hills behind the hotel, rummaged along the seashore, and fished in the lakes and rivers for the then-abundant sea trout. For me, however, the day always started and ended in the heart of the hotel: the kitchen. I loved the energy there, the chatting and the madness of the race to be ready for dinner. After a couple of years, when I was about seven, a new cook joined us, and she was not willing to allow me in the kitchen if I was not being useful. So, I started my education; she taught me how to make ice cream for the guests. My father would always stop and chat with everyone in the dining room during dinner, and if he found that they were having ice cream for dessert, he would proudly announce ‘my seven-year-old daughter made that.’ He would also wheel me out before dinner to eat oysters with the guests; it was sort of his party trick, and I was willing! As my interest grew, another chef brought me out to pick nettles for a spring nettle soup, and just like that, my lifelong adventure in foraging began. I loved it. I thought that gathering and eating wild food was the coolest way to spend a day. When my daughter asked me the other day what my childhood was like, that’s what I thought of: picking wild mushrooms, peas from the garden (at that time, we had a big kitchen garden) and berries from the hedgerows. This was partially out of boredom due to living in the wild, rural west of Ireland. Foraging might have just remained an idle pastime, but living in the family hotel with chefs nearby led me to create something that tasted amazing, and that just pulled it all together and caused me to go for it full throttle. I was determined not to follow in my parents’ footsteps by running the hotel because I figured it was far too much hard work. So, I went on to study arts at University College Cork (now National University of Ireland, Cork). I used to make tarts and sell them to cafes for pocket money, and I realized that I had much more interest in the tarts than I did in the arts. As a result, I left college and went to Dublin to take up a position as a pastry chef at Jacob’s Ladder Restaurant, which was owned by Adrian Roche, a chef who had spent many years working at my parents’ hotel. I have a deep-seated belief, probably as a result of my own childhood, that children should be introduced to cooking at an early age. I continued working in restaurants and hotel kitchens, and after spending a season at Newport House in County Mayo, I decided to go to cookery school at Ballymaloe. I absolutely loved it; the focus on organic food and on supporting local farmers really struck a chord with me. It was such a comfortable fit with my own ethos and upbringing. Cookery school also gave me confidence in my skills and helped me appreciate how much I had learned. I saw with clarity the value of my upbringing and my background in food. When I graduated from Ballymaloe, I took the helm in the kitchen of the Delphi Lodge in Connemara, where I spent eleven glorious years as head chef with the lodge’s inspirational owner, Peter Mantle. I had completely free rein in the kitchen and the larder. Delphi is a salmon-fishing lodge, so wild salmon was brought into the kitchen very frequently; the woods were also covered in wild garlic and wild mushrooms. We had fresh fish from the coast, mussels from Killary Bay, woodcock shooting in the winter, free-range eggs … The lodge’s kitchen was just like the kitchen I had grown up in, but now I was the chef. It was a magical time for me, and I developed as a chef and found my own way. Just before going to Delphi, I had met my husband, Patrick, who was a big part of the reason I returned home to Connemara. Patrick manages Ballynahinch Castle Hotel and Estate, so I fell right back into the arms of the hotel business. I actually somewhat enjoy that life even though I’d spent years trying to scramble out of it. After our third child, Milo, was born, I realized that a full-time kitchen job (with all its late nights) was not an ideal way to raise my family, so I left Delphi. I wanted to continue working in some way while still being close to the children. I have a deep-seated belief, probably as a result of my own childhood, that children should be introduced to cooking at an early age. This is not just so that they can learn to cook (which is great) but more importantly, it gives them a confident and healthy outlook on life. They get a better appreciation of how the planet works and of the role that they have to play. 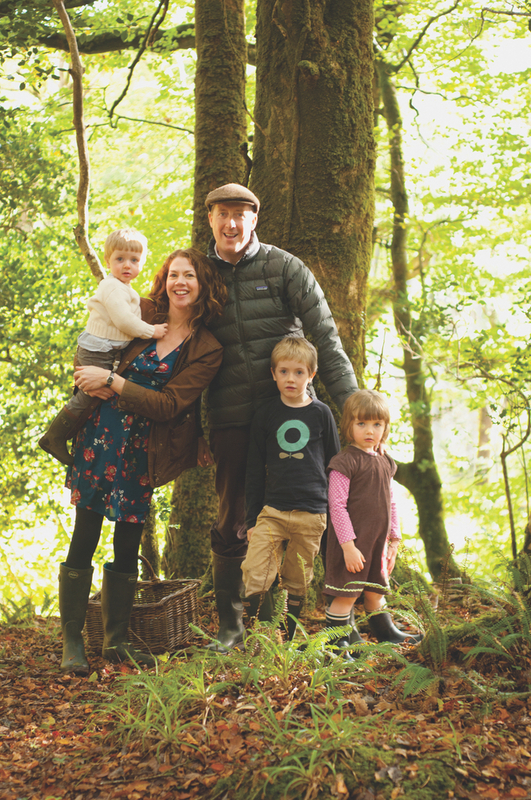 I started filming the online cookery programme Breaking Eggs with my children, Jake, Iseult, and Milo, as a way to encourage parents to involve their children in every aspect of food— growing, gathering, and cooking—from an early age. For the programme, we examine the sources of our food by going to a farm, visiting a cheese maker, picking mushrooms in the woods, fishing, going to markets, and so on. We then bring that food back to cook it in the kitchen of our family home. We have found such great pleasure in meeting all the food producers and listening to their passion-filled stories. The kids are pretty amazing, and they have a fantastic understanding of food and of the people who grow, gather, and produce it. Over the past year and a half, I also started a workshop called Lens and Larder with my good friend Imen McDonnell (find her blog, Farmette, at Farmette.ie). 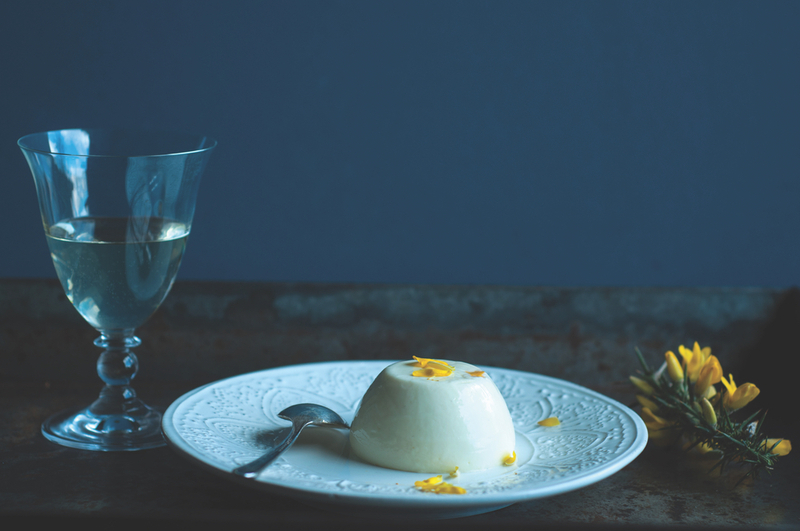 Born out of our shared love of food and photography, Lens and Larder brings world-class photographers and food stylists to extraordinary places in Ireland to teach the arts of food photography and visual storytelling during three- and four-day workshops. This is an amalgamation of everything I love: food, photography, people, and creativity. I enjoy every second of these workshops; we take the participants foraging and often do some hands-on cookery with them before teaching the photography and food styling. Each course is unique because of the different locations, seasons, and instructors. We keep the numbers small so that we can offer one-on-one attention and learning, which also means that many new friendships are forged at the workshops as the participants spend time with people who share their passions. Connemara influences my cooking in ways that I’m not sure I can explain properly. The flavours from this place are what make me tick. Therefore, I’d like to share some recipes that reflect Connemara and its produce. 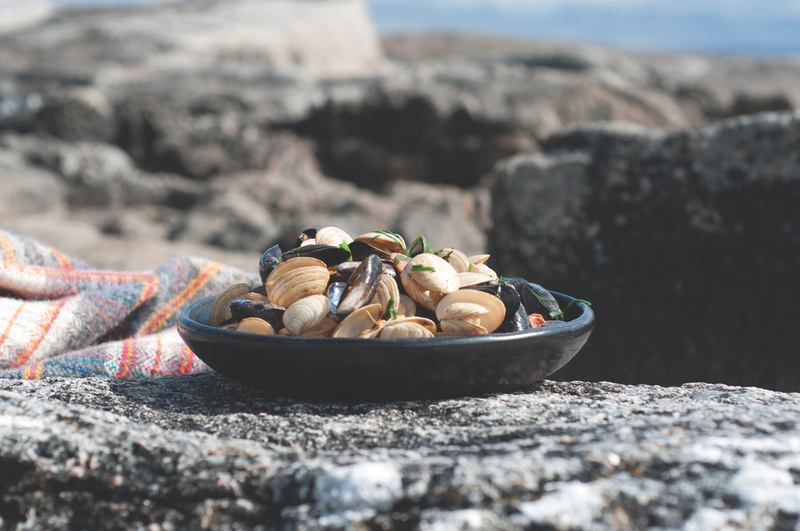 The first is a dish made with mussels and clams, which can both be found all over our coast, where they are fresh and delicious. We often cook them using a little gas burner while on the beach because they taste even better there! For this recipe, I have used fresh wild garlic and an Irish chorizo made by Fingal Ferguson of Gubbeen in County Cork. If you cannot find wild garlic, you can use ordinary cloves of garlic and some nice, fresh flat-leaf parsley. 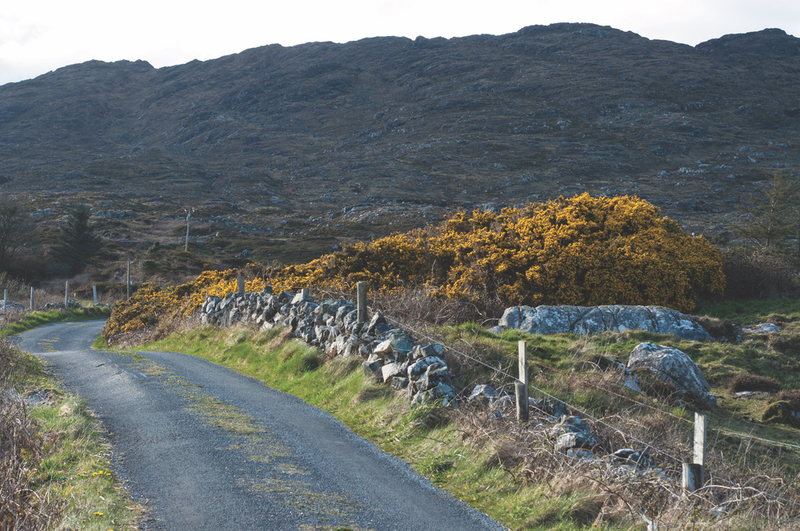 For the second dish, I have used gorse, which is a very prickly, yellow-flowering shrub; it grows in great profusion around Connemara and can be found all over the roadsides and hills. You need heavy-duty gardening gloves to pick it, but the amazing fresh flavour, which is like green coconut, is worth it. 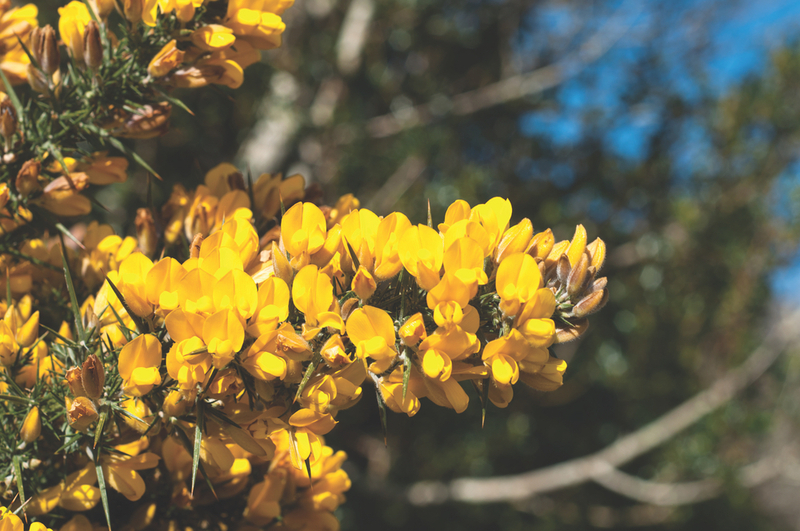 It is also known as broom or furze, and it may grow in an area near you; if not, you can substitute coconut milk for cow’s milk in this recipe to achieve a similar flavour. Put a large pot on a medium heat with a little oil and add the onion to soften (if using regular garlic, add it now as well). Turn the heat up and add the mussels, clams, and white wine; stir. Add the wild garlic and chorizo and stir, making sure all the mussels and clams get tossed around by moving the ones on the bottom to the top. Cover the pot for 1 minute to allow the mussels and clams to steam, and then mix thoroughly (if using fresh parsley instead of wild garlic, add it now). Cover the pot again. It should take 5 more minutes for most of the shellfish to open. Remove the pot from the heat. At this point, if any rogue mussels or clams are unopened, discard them. Serve immediately with some brown bread to mop up the delicious juice. Put the milk and cream in a pot with the sugar and bring to a simmer, stirring until the sugar is dissolved. Remove the pot from the heat and add the gorse petals, saving a few for decorating later. Stir the petals into the milk and set aside to cool completely. Grease six 6-ounce dariole moulds or ramekins liberally with sunflower oil and sprinkle 3 or 4 gorse petals at the bottom of each mould. Strain the milk mixture into a bowl, gently squeezing the milk from the gorse petals through the sieve; discard the petals. Take a small amount of milk (about two tablespoons) and mix it into the clear gelatine. Then add that gelatine mix back into the large bowl of milk and whisk thoroughly. Now add the natural yoghurt and whisk until it is combined and smooth. Divide the mixture between the six moulds and refrigerate for 3–4 hours until set. To serve, turn the mould upside down and run it under warm water for a few seconds; then place the mould upside down on a plate. 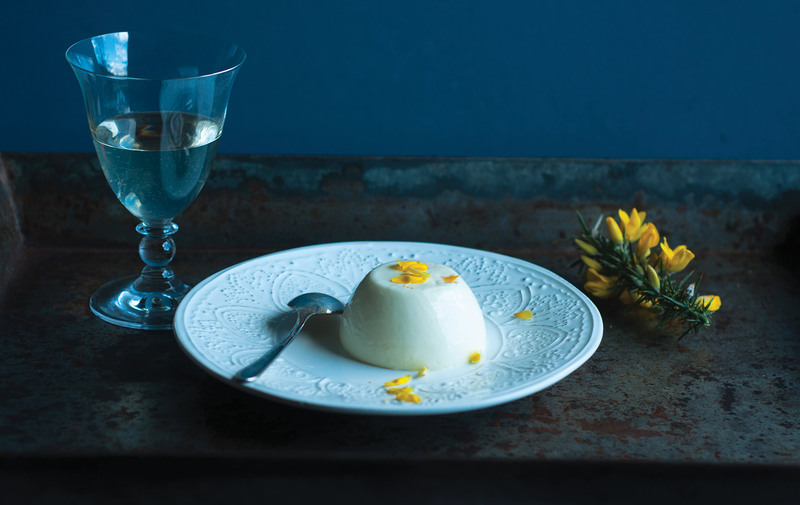 It may need a little shake, but the panna cotta will slide out easily as you lift the mould. Scatter a few fresh gorse petals on top and on the plate.